The scenic and remote high desert of Central Oregon, several miles north of Bend, provides a beautiful backdrop for Haystack Reservoir. Salmon, trout, crappie, bass, and catfish attract anglers to the reservoir. Just 38 miles north of Bend via Hwy 97. A scenic high desert landscape provides a remote getaway. Nearby Haystack Campground offers 24 campsites for those who want to get an early start on fishing. Just 38 miles north of Bend is Haystack Reservoir, situated in the high desert of Central Oregon. 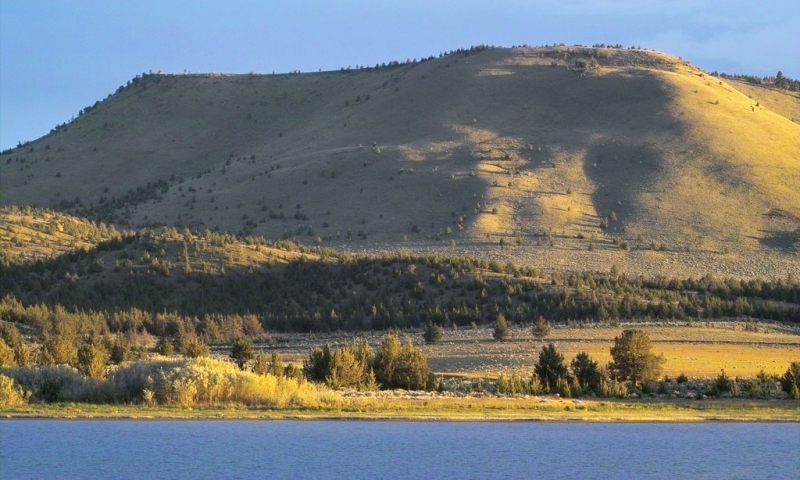 Surrounded by sagebrush, interesting rock formations, and irrigated pastures, this 240-acre reservoir was created in the mid-1950s and named after Haystack Butte to the south. Trout, crappie, and bass attract anglers to this remote reservoir, especially in the spring. Even when only a few fish are biting, the beautiful high desert landscape and breathtaking views of Mt. Jefferson make Haystack Reservoir a scenic and peaceful getaway. Haystack Reservoir, Oregon, is located about 38 miles north of Bend. It is just a couple miles east of Highway 97. Crooked River National Grassland, 813 S.W. Hwy. 97, Madras, OR, 97741. Phone: 541-475-9272. Fishing – A variety of fish reside in Haystack Reservoir, including rainbow trout, Kokanee salmon, black crappie, largemouth bass, and brown bullhead catfish. The reservoir is usually open all year long, but always check with the Oregon Department of Fish and Wildlife regarding regulations. Camping – There are 24 campsites available at nearby Haystack Campground. This modern campground can be found on the reservoir’s shore. Birdwatching – Haystack Reservoir attracts a variety of birds including the red-necked grebe, common loon, trumpeter swan, bald eagle, and osprey. Haystack Reservoir has a 5-mile long shoreline. The reservoir reaches a maximum depth of 75 feet, and its elevation is 2,900 feet. During the spring, you may be able to hear the chirping of the Pacific Chorus Frog – also known as the Pacific Tree Frog. On a warm summer evening large numbers of male frogs may create a lively “chorus”. Used for irrigation, the reservoir’s water levels can drop significantly in the summer.